GoDogGo is the World's Original Fetch Machine & Only Remote Controlled Automatic Ball Launcher for Dogs. 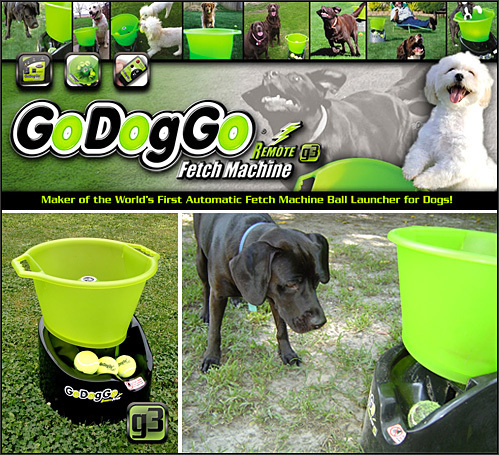 GoDogGo, Inc is the designer, inventor, patent holder & manufacturer of the original and only automatic Fetch Machine ball launcher for designed for dogs. We are a small, family-run American corporation owned & operated in Gig Harbor, WA USA. Over the years and to date, GoDogGo, Inc. is recognized for their commitment to first-rate customer service and product support. Our mission continues to be to provide the highest quality Fetch Machine at a fair market price while providing superior customer service and product support. We are proud to manufacture the original GoDogGo Remote Fetch Machine automatic ball thrower for the health and happiness of ball-loving, fetch-crazy dogs everywhere. GoDogGo, Inc. - Maker of the World's Only Automatic Ball Launcher Designed Specifically for Dogs, to Play Fetch with Dogs! AC Adaptor AND Battery Power: Every GoDogGo® Remote G3 Fetch Machine can be powered by either AC Adaptor or Battery Power. 2 power types allow GoDogGo® to be conveniently used in a variety of settings when at home or away. NOTE: It is recommended to remove batteries when using GoDogGo® on electrical power. 3 Distance Settings: GoDogGo® is the a superior interactive dog toy with 3 distance settings for use in various settings from your backyard to the baseball field. GoDogGo® Fetch Machine can be adjusted to launch between 12 and 45 feet depending on the ball type & size in order to meet your active dog’s needs and the desired fetching area. 2 Time Intervals: GoDogGo® has automatic and manual ball launching settings. In automatic mode, GoDogGo launches balls every 7 to 15 seconds for your dog to retrieve. In manual mode when using the remote control, a ball will launch a minimum of 7 seconds which can be determined by pushing the Remote Launch button on the remote control feature. Safety Feature: GoDogGo was designed with an Automatic Sensor & Safety witch with an Auto Stop feature for your dog's safety. Please train your dog to stand in a safe location while waiting for a ball to launch. Most dogs naturally stand back from the unit, but please teach this behavior upon first use. Balls launch at high speeds so be sure you or your dog do not stand directly in front of the launch area. The sensor is sensitive to the weight of a ball and is located in the launch pocket area. NEVER touch the safety sensor or kicking mechanism when the machine is on. After following the simple safety rules, GoDogGo® ball launcher will provide hours of fetching fun and exercise for both you and your dog! GoDogGo® Fetch Balls: GoDogGo® Fetch Machine was invented for our active, fetch-crazy, tennis ball loving Labrador so each unit comes with 6 GoDogGo tennis balls. Additional GoDogGo Fetch Balls available or use your dog’s favorite ball. Compact and Lightweight: GoDogGo® Fetch Machine is lightweight at just 11 lbs and compact at 15x13x17.5". Our ball thrower fits conveniently in a trunk or closet and the easy-grab handles make carrying GoDogGo anywhere you want to take it easy. High-Quality Materials: GoDogGo® is produced with only the highest quality materials and components, as well as high-impact injection molded plastic to hold up to hours of ball fetch and retrieval for the active fetch dog. The all new G3 gear and motor system is produced by the makers of Bosch, Makita and Hitachi drill gears & motor systems. Is GoDogGo For Use Indoors and Outdoors? GoDogGo® is recommended for OUTDOOR USE due to the speed, height and distance of the ball launch. With a pressurized or hi-bounce ball, GoDogGo® has a minimum launch height of approximately 12 feet. Many customers use GoDogGo® indoors by using a heavy and/or hollow ball that is not pressurized which will help to reduce the launch. Ball examples to reduce height/distance: Buddy Glow Ball–14' distance/6' height; ProPenn Tip 2 trainer ball-18' distance/8' height; Chuck it standard size Tennis Ball–11' distance/4' height; Planet Dog RecycleBall–9' distance/6' height. How Long Will GoDogGo Run On Battery Power? Each GoDogGo® G3 Fetch Machine runs on an AC Adaptor and Battery Power. If using battery power, GoDogGo will run for approximately 25 hours on 6 D batteries. What Is The Size and Weight Of GoDogGo? GoDogGo® automatic ball launcher is easy to move and store at approximately 15x13x17.5" and 11 pounds in weight. Please follow our simple safety rules below for hours of fetching fun for both you and your dog. GoDogGo® ball launcher is not a child's toy and balls launch at high speeds. It is recommended to monitor your dog's waiting location and to teach your dog where to stand upon first use. Do not touch the safety sensor or kicking mechanism when the machine is on. Never allow your dog to take from or replace a ball to the launch pocket area. What Do Customers Say About GoDogGo? Our dog loves this product. This "toy" is an integral part of our dogs daily routine. My dog mastered returning the ball in just a few minutes. This will be great fun when I’m trying to work in the yard and he wants to play! Bailey is addicted to this thing. Love the product and the company, you bring fun and exercise to my dogs life. Ewan, Buddy and Eliot love your products! Thank you again for providing such an exceptional product and customer service. GoDogGo ROCKS! I purchased one of your remote fetch machines several years ago and my dog still absolutely loves it. I really appreciate all of your help. You guys have just been excellent, super awesome customer service - nice job! Order Your GoDogGo Fetch Machine Today! You love your dog and want him happy. Few things make a dog so happy as chasing and catching balls! Great entertainment, exercise, stress relief, and freedom from boredom. For more information about the GoDogGo Fetch Machine or to place an order, please visit our website.